Activities - What to do in Dubrovnik ? Ever came to a vacation in a foreign city and wondered: What now? With our Dubrovnik Vacation activities planner you will avoid the trouble of useless wondering and pointless wandering! Vacation Activities is a Dubrovnik City service where we arrange or recommend activities for you according to pre-grouped interest sections. 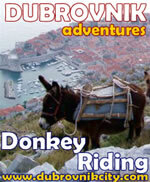 Adventures allows you to book single or a stand-alone service in Dubrovnik region. There are many different adventures available for you to choose from such as Horseback riding, Scuba diving, Yachting, Speed boat adventure, Rock Climbing, Caving, Bungee jumping, and many other. Restaurants indulge you with the best Dubrovnik restaurants and cuisine spots making sure that you enjoy only the finest of food and drink. We ensure there is a table waiting for you while you enjoy the delicacies. Beaches takes you swimming to the most beautiful beaches of Dubrovnik region and gives you sunbathing tips to get your tan to that special, desirable, bronze color. Night out needs no special introduction. Things to do in Dubrovnik when the sun sets to sleep is the main topic of this vacation activitiy section. Shopping introduces you to the shopping venues of Dubrovnik and other places of interest where you may spend your alloted vacation shopping time. Sightseeing takes you on a journey throughout Dubrovnik region, giving you a chance to enjoy history, nature, and panorama. We pick the best for you so you don't have to. Weddings is filled with useful information to help you get your Dubrovnik wedding started. Wedding dresses, wedding venues, and other information inclusive of Dubrovnik wedding bureocracy problems fills thie section.